Enroll today and receive 10 points FREE! Here at Mattie Lu we have created our loyalty program with exciting and exclusive rewards to say “thank you” to our amazing customers. 1. Earn one point for every dollar you spend to unlock exciting rewards. 2. There are numerous ways to earn loyalty points with Mattie Lu. 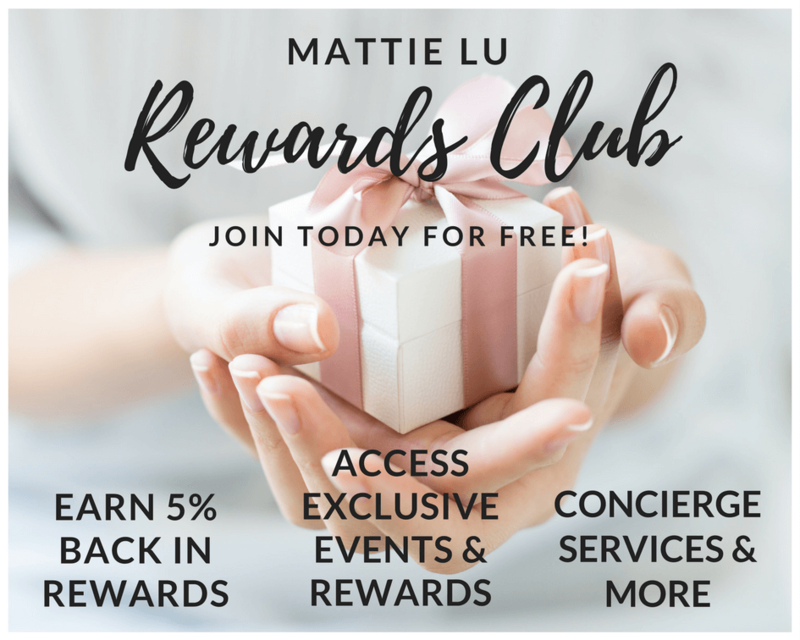 You can earn points by joining the club, purchasing products at Mattie Lu, liking, following and sharing us on social media, referring friends, and product reviews. 3. Shop and earn 5% back in ML Reward Dollars for all qualified purchases. Be sure to use the same email address you enrolled with on every purchase. 4. Check your inbox for exclusive Mattie Lu Rewards Club offers and surprises including a special birthday offer during your birth month. 5. Don’t forget to take advantage of other benefits like our concierge services and design consultations. Earn 250 loyalty points and get $12.50 off your order. Earn 500 loyalty points and get $25 off your order. Earn 1,000 loyalty points and get $50 off your order. Earn 2,000 loyalty points and get $100 off your order. Earn 4,000 loyalty points and get $200 off your order. Earn 10,000 loyalty points and get $500 off your order. What are the benefits of being a Mattie Lu Rewards Club Member? In addition to earning ML Reward Dollars on every qualified purchase, club members are eligible for invitations to exclusive events, early access to shopping, concierge services, design consultations, and surprise offers. How do I join Mattie Lu Rewards Club? Simply create a Mattie Lu Rewards Club account, and you will automatically become part of our program. You can also join by using our loyalty club widget, ML Rewards, on the right side of your screen. Earn 1 point for every $1 you spend with Mattie Lu*. Each time you spend you will receive an email with your updated loyalty points balance. There are also plenty of other ways to earn loyalty points under the “Earn” tab of your loyalty profile, such as liking us on Facebook, following us on Instagram or referring friends. Use your loyalty points to claim the rewards that you want, or save them to unlock higher points required rewards. *Excluding shipping fees, taxes, and discounts applied. How will I receive my ML Reward Dollars? Every time you shop, let us know you are a Mattie Lu Rewards Club Member by providing your registered email at checkout. Each time you shop, you will receive our loyalty program email with your updated loyalty points balance. From our email, click into your customer portal where you can claim rewards. You can also long in on our website by clicking our ML Rewards widget. When you’ve unlocked a reward, you will receive a unique reward coupon. You can redeem your reward coupon on our payment page during checkout. Just copy and paste your unique code into the Discount bar and click Apply (only one coupon code per order). Do the points cost get taken away from my balance when I redeem a reward? Yes, as soon as a reward is redeemed, your points balance is adjusted, removing the points cost. Can I redeem more than one reward at a time? Even if you have enough points to redeem multiple rewards, you can only use one reward discount code at checkout at a time. When do my ML Reward Dollars expire? Good news, your ML Reward Dollars do not have an expiration date. Can I purchase a Gift Card with my ML Reward Dollars? No, customers are not able to purchase Gift Cards with ML Reward Dollars. However, you can earn ML Reward Dollars on any Gift Card purchases you make. Can I transfer my ML Reward Dollars to another person? No, we do not currently support transfer of ML Reward Dollars between people. • Mattie Lu reserves the right to modify or cancel coupons at any time. • Coupons can only be redeemed once. • If you redeem your coupon online for a purchase less than the full value of the coupon, the balance of the coupon is not redeemable on another purchase. • If you return any of the items purchased with a coupon, the coupon discount or value may be subtracted from the return credit.